So the other day I woke up to this note on the kitchen counter. My hubby occasionally perceives threats in otherwise harmless animal species that may or may not be real. For example, he thinks that all birds have an innate desire to immediately peck your eyeballs out. Every time a bird gets in the garage or (once) the house he usually screeches uncharacteristically and flees the premises. It’s pretty funny and he might not appreciate me blogging about it, but I find his bird-fear endearing. Anyhow, I figured he saw a rat in the garage scurrying away and was making a funny. Nope, turns out that when he opened the garage door to come in from his night-time soccer game the rat ran straight for him in it’s panic. I can only imagine his screech and how high he jumped. (As I imagine just about anyone would do when accosted by a crazed rodent in the night). That, my friends is a pile of grass seed interspersed with an unbelievable array of big juicy disgusting rat turds. The area also had a particularly pungent urine smell. 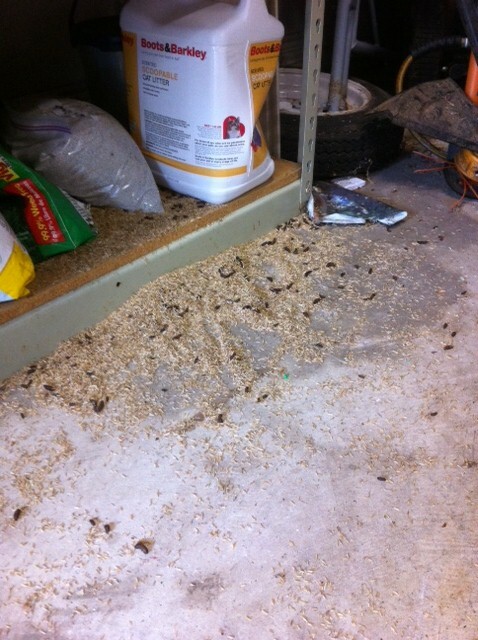 Apparently the rats had moved in, torn open the bag of grass seed and had a damn party in my garage. I immediately held my breath and scurried away (after snapping a photo of the carnage). Visions of Hantavirus, Leptosporosis and Plague dancing in my head. God knows what other diseases those creatures are carrying, not to mention fleas and such. IN MY HOME! However, this is not without some trepidation. I did take an oath not to harm any animals. I don’t even kill bugs in the house. Generally they are gently relocated to the more bug appropriate outdoors.One of the “Momisms” my kids will have burned into their psyche is : “Don’t kill something just because you can”. I do have a caveat to my general live- and-let-live approach to resident creatures: if they can in any way harm my family, they’re dead meat. Thus, these wild rats with their associated diseases are officially in my crosshairs. Not that I have anything against rats in particular, I had several pet rats through college. They were super sweet, smart, clean lovely pets. From known breeders and generally disease free. These street rats are another story. Lepto in the urine. Hantavirus in the stool. And apparently they pee and poop constantly as evidenced by the sheer volume of excrement in my garage. So then comes the strategic military offensive: Operation Carroll Garage Rat Kill. First we removed all the edible stuff from the garage, grass seed, bird seed, etc. The other night I heard them scurrying around, so my first foray into raticide was biowarfare. I set Katelin (my Min-Pin) on them. She is an avid ratter (well, she tries really hard, but I think she’s only killed one rat in the last 14 years as opposed to Scully who’s count stands at around 6. I live near a greenbelt in Allen and we get periodic waves of rat activity. One of the downsides of living near new construction and having lots of trees around. I did set Scully on the rats too, but she’s half blind and mostly deaf so she’s of limited use). Anyhow, Katelin immediately zeroed in on the vermin, tail stiffly wagging in her “deadly killer” mode but the rats retreated to nooks and crannies she couldn’t reach. The next attempt involved glue traps. I figured I might have to deal with a semi-dead glued-on rat in the AM. I decided I’d cross that bridge when I got to it. I figured I could somehow scoop it into a bucket or something then take it to work and euthanize it. However, the next morning dawned with the glue traps scattered about the garage with little rat footprints all over them. Thus, I reluctantly settled on my current tactic: chemical warfare. You guys all know why I’m hesitant on this one. If there is some way for a pet to become poisoned and require hospitalization, vomiting induction, etc. Mia (my 3-year-old Labrador Retriever) will find it. She’s a magnet for trouble. Granted, she is rarely in the garage, but if there ever is a time to accidentally leave the door open and have her wander in and chomp on some rat bait, this is it. As far as poisons go, this would be a “good” one for Mia to get into because there is an antidote to it (Vitamin K). The problem was that Lowe’s only had the little granules which the rats usually scatter (I know this because we’ve treated dogs at work for getting into the scattered granules). My next choice is Bromethalin. This stuff is nasty because there is no antidote for it. It causes the little rats brains to basically explode. This translates in pets and humans to cerebral edema, which causes neurological signs like trembling, weakness, seizures, loss of hind leg use, coma, death, etc. Notice how close the names are: bromethalin, bromadiolone and brodifacoum. This is why it’s EXTREMELY important, if your pet gets into rat bait to BRING THE LABEL/BOX/CONTAINER to the vet with you. Make sure your vet reads it closely. If they accidentally treat a bromethalin toxicity with Vitamin K, it won’t work and the pet could die. The bromethalin comes in a nice kid/dog proof bait station. It’s hard plastic and basically the rat has to go through a maze to get to it. The bait is locked into the station so the rat can’t drag it out and put it where the dogs can get it. Supposedly the rats run off to the sewers to die because it makes them thirsty. The traps are set. The garage has been thoroughly de-rat pooped, so I will be able to monitor their activity via any new deposits. I am a big fan of rat traps – IMO by far the most humane way to kill the critters and non toxic. They can break a dog’s toes though, so you have to be careful about placement. Thank you for the distinction between bromethalin and bromadiolone. Good to know, in case I get rats that are too smart for my traps! I’m curious about your first line of attack by setting the dogs on them. Isn’t there a possibility of the dogs catching something from them? In hindsight ya, the dogs could have caught Lepto from the rat, but they are vaccinated. I was thinking about how triumphantly happy they are when they actually kill something. It’s a big ego boost for them. However probably not the best idea. There is a gap on the side fo the garage door where the wood has rotted where they are getting in. Good luck! 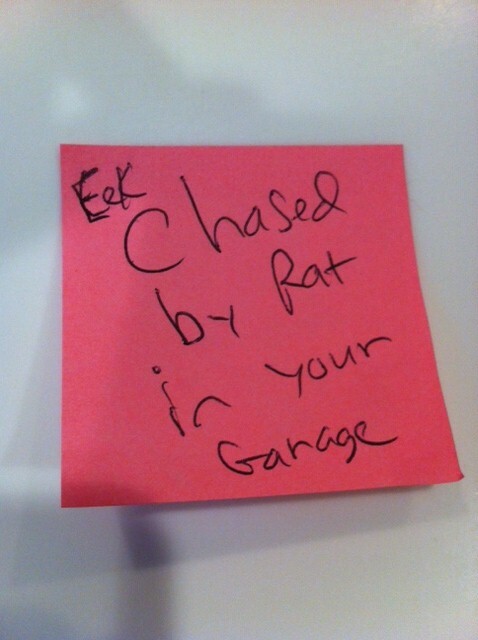 Better the garage than the attic… I heard something scurrying up there the other night…yikes! Jon HATES rats also, it’s those little hairless tails of theirs that freak him out. Hope your chemical warfare wins the rat battle!